I have a lot of fun finding inspiration from my fellow bloggers. My friend, Gloria from Simply Gloria, recently made two kinds of desserts using Oreo cookies (Snickers Oreo Caramel Bars and Oreo Pudding Cookies). They both look amazing and you should check them out, along with many of her other great ideas. Since seeing those Oreo desserts I’ve been itching to bake with Oreo cookies. Plus I have been in the mood for cheesecake. 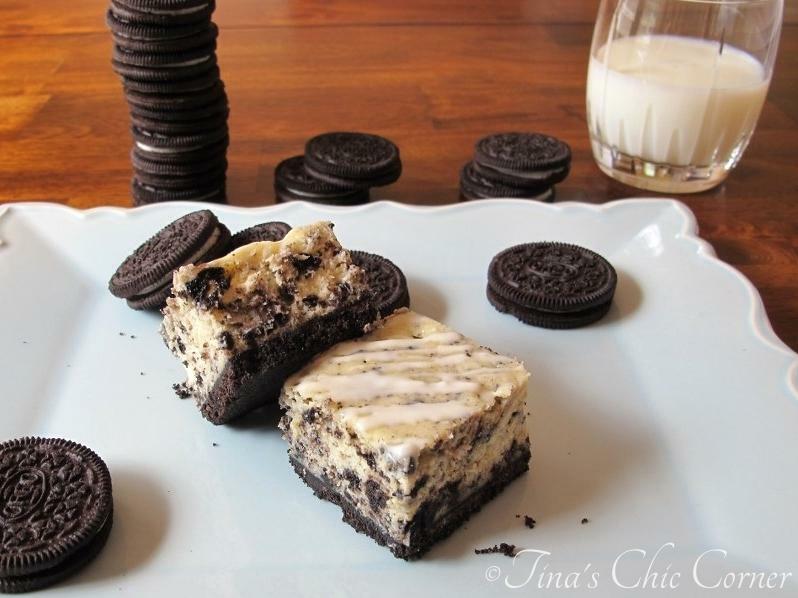 The perfect solution to both was to combine the ideas and create Oreo cheesecake bars. 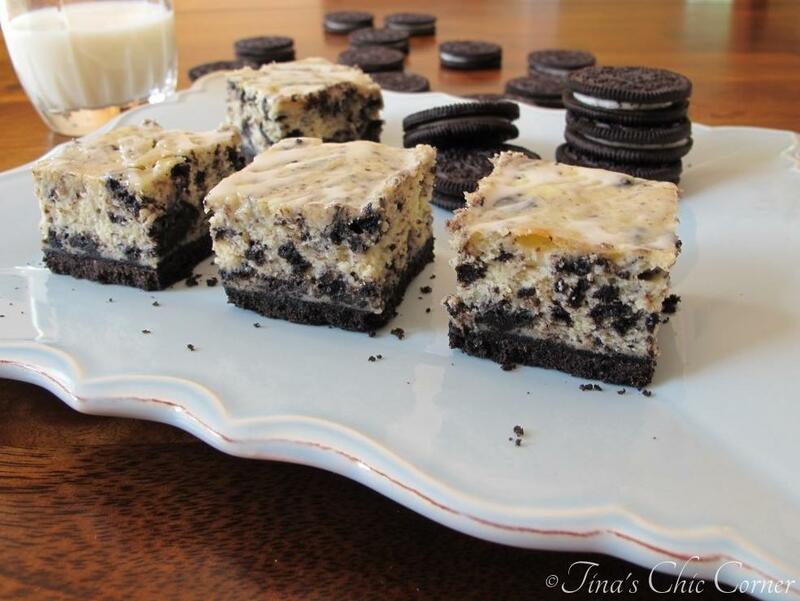 These bars are a classic cheesecake loaded with chunks of Oreo cookies on top of a thick Oreo cookie crust. It’s an Oreo cookie party! Note: This recipe requires chilling time. See directions for more information. Grease an 8 x 8 baking pan. 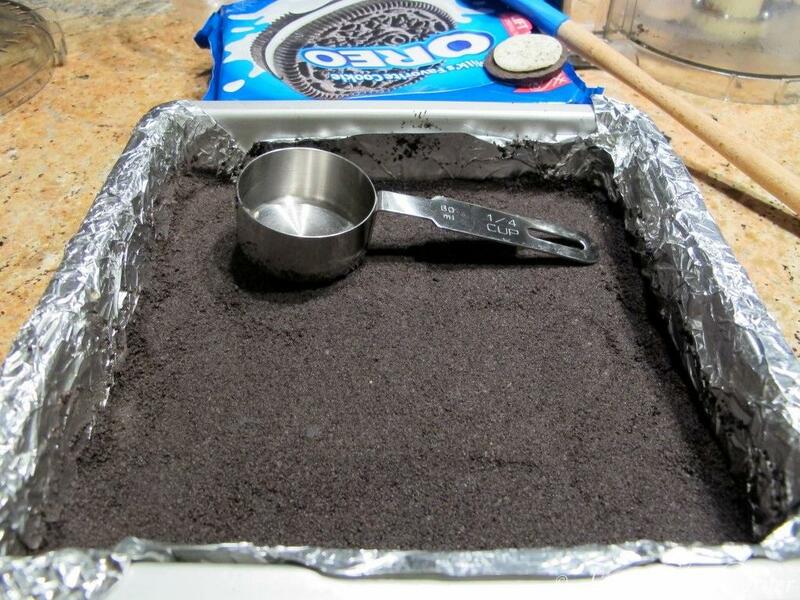 To prepare the crust, place 24 Oreo cookies into a food processor and pulse until they are fine crumbs. Drizzle in the melted butter and continue to pulse until the butter is distributed evenly and the crumbs are moist. Place the cookie crumbs into the prepared baking pan and press down firmly in an even layer. Bake the crust in the preheated oven for 10 minutes. To prepare the cheesecake filling, in a large bowl, beat the cream cheese until it’s smooth (about 2 minutes). Beat in the white sugar. Beat in the sour cream and vanilla extract until combined. Gently fold the chopped cookies into the cheesecake filling. 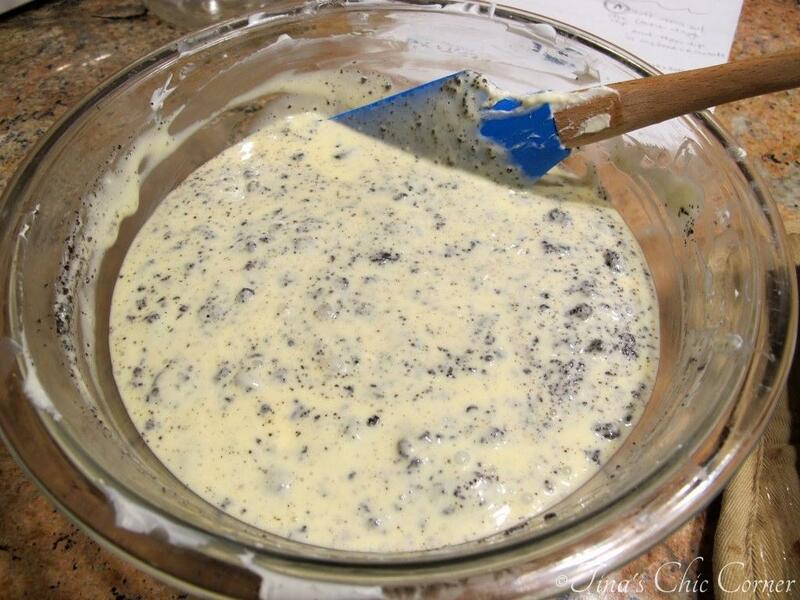 Pour the cheesecake cookie mixture onto the baked crust. Place the cheesecake bars back in the preheated oven and bake it for an additional 40 to 45 minutes, or until the middle only jiggles a little. Allow the cheesecake bars to cool and then cover the pan with plastic wrap and chill in the refrigerator before serving. I chilled it overnight. You may be able to chill it for less time depending on how cold you like your cheesecake. Cover it with plastic wrap and store it in the refrigerator. Chop 15 Oreo cookies for the cheesecake layer. I found it easiest to place them in a zip lock bag and smash them with a rolling pin until the cookies resembled chopped pieces. The pieces will be a variety of sizes when you are done, and that’s exactly what you want. If you’re not familiar with baking cheesecakes, the cheesecake mixture will be a tad runny at this step. Ah, here comes the waiting game. Most of us don’t like it, but sometimes it’s a necessary evil, especially with cheesecake recipes. Once the bars are done baking let them cool to room temperature. Only then can you place them in the refrigerator to chill. Cooling it too quickly by putting it immediately in the refrigerator will cause the cheesecake to crack like the grand canyon. (It may also thaw everything in your freezer, there is a lot of heat in a cheesecake right out of the oven.) I like my cheesecake very cold so I chilled mine overnight. In fact, I kept them in the fridge until the moment I was ready to serve them. I personally like the texture better when they are super cold. Seven ingredients are all you need for this recipe! How awesome is that? The cheesecake cookie layer is wonderfully creamy with a little crunch from the Oreo cookies. The Oreo crust is the perfect match with the cheesecake layer because it adds more chocolate cookie flavor to every bite. These bars do not need a topping which is why I didn’t list it in the ingredient section. However, I often like to add a little “something something” to the top of a dessert bar. It’s probably the home decor in me coming out in my desserts. 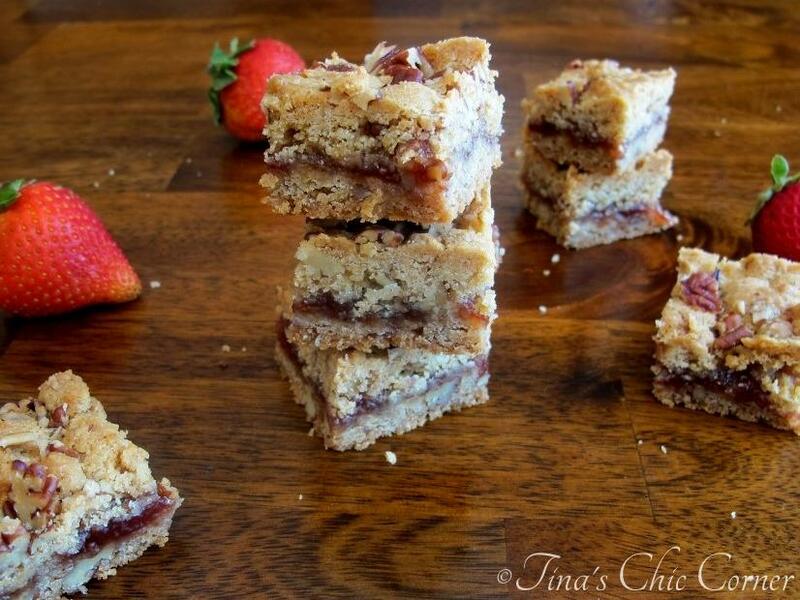 Jamie from My Baking Addiction coated her bars with a chocolate ganache. I melted some vanilla store bought frosting and drizzled it over the top. It adds a lovely hint of vanilla that doesn’t have any cookie in it. You know, for a little change of pace from the rest of this masterpiece. 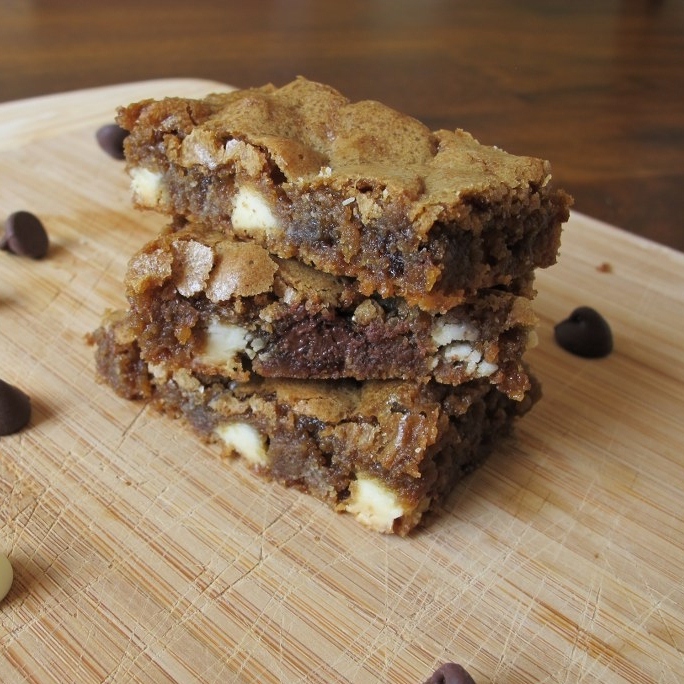 Here are some of my othe favorite bar cookies. I love this! I love oreos and while I’m not a huge fan of cheesecake (a bad experience a few years ago) I love seeing all the different variety of cheesecake desserts. 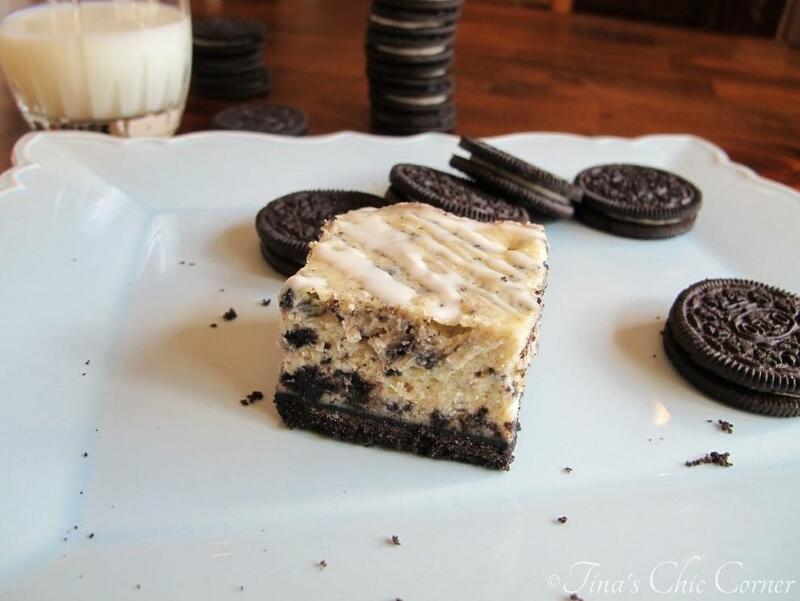 There are so many oreos in these bars that they may turn me into a cheesecake lover! Oh my gosh if I turn you into a cheesecake lover you have to let me know. 😉 I totally understand where you are coming from though. My friend is the same way. I think cheesecake is one of those things where someone either loves it or not at all. Oh my! I am in pure Oreo heaven! (And with the cheesecake part!) 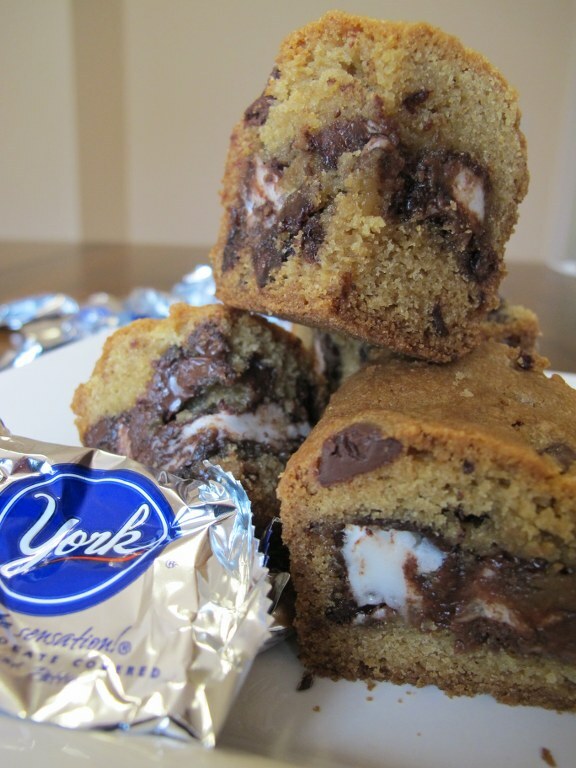 My favorite part is that they’re in all in a bar form…Yum! Your step by step photos rock…so, I take it you like to twist off the tops of your oreos?! Too funny! (I like to eat around the edges of the top part…everyone has their own special way, right?) Love the frosting idea…fast and easy! And, very classy looking. Oreo cookies are hands down one of the greatest dangers to me, I love them dearly! Your oreo bars look fabulous, going to keep them on the list to make for my weekly friday treats! 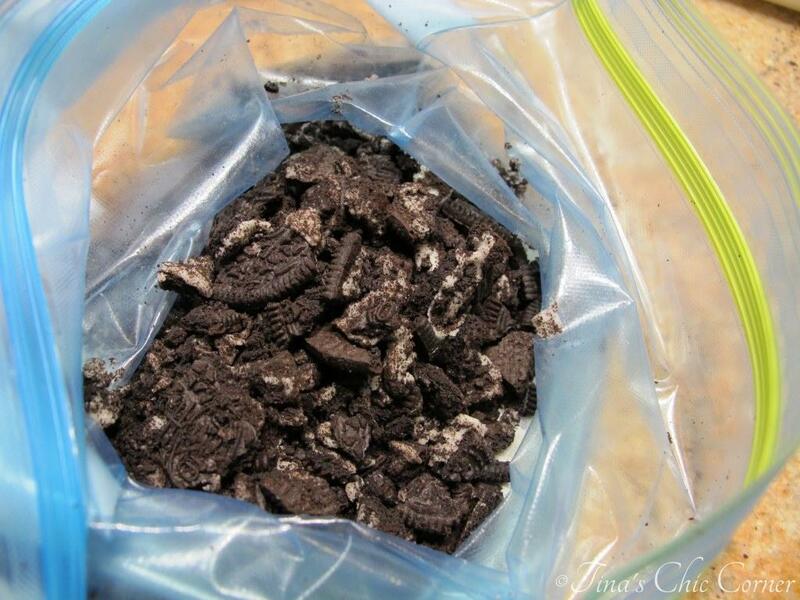 There can never be enough recipes with Oreos! Your’s look and sound fantastic. And I love the addition of a vanilla frosting on top. I bet it tastes delicious!